Kazakhstan is located in Central Asia. 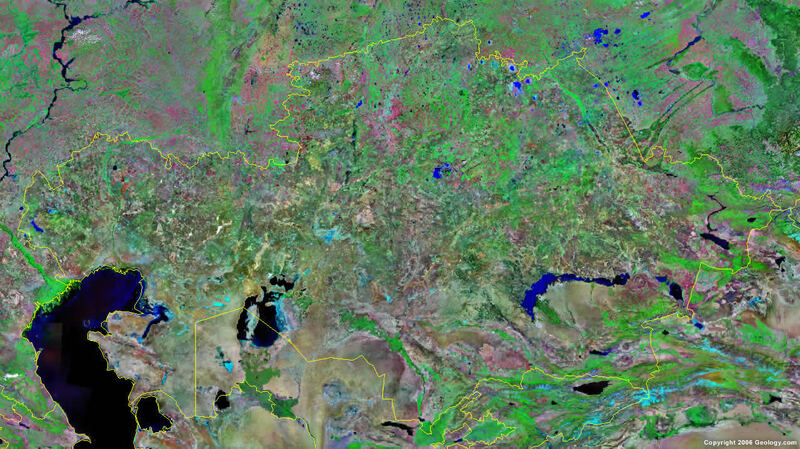 Kazakhstan is bordered by the Caspian Sea, Russia to the north, China to the east, and Kyrgystan,Uzbekistan, and Turkmenistan to the south. Google Earth is a free program from Google that allows you to explore satellite images showing the cities and landscapes of Kazakhstan and all of Asia in fantastic detail. It works on your desktop computer, tablet, or mobile phone. The images in many areas are detailed enough that you can see houses, vehicles and even people on a city street. Google Earth is free and easy-to-use. Kazakhstan is one of nearly 200 countries illustrated on our Blue Ocean Laminated Map of the World. This map shows a combination of political and physical features. It includes country boundaries, major cities, major mountains in shaded relief, ocean depth in blue color gradient, along with many other features. This is a great map for students, schools, offices and anywhere that a nice map of the world is needed for education, display or decor. 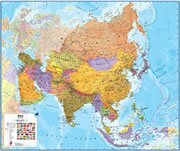 If you are interested in Kazakhstan and the geography of Asia our large laminated map of Asia might be just what you need. It is a large political map of Asia that also shows many of the continent's physical features in color or shaded relief. Major lakes, rivers,cities, roads, country boundaries, coastlines and surrounding islands are all shown on the map. Almaty, Aqsay, Aqtau, Aqtobe, Aral, Arqalyq, Astana, Atbasar, Atyrau, Ayagoz, Balqash, Beyneu, Ekibastuz, Embi, Esil, Kokshetau, Leninsk, Lepsi, Oral, Oskemen, Panfilov, Pavlodar, Petropavlovsk, Qabanbay, Qapshaghay, Qaraghandy, Qostanay, Qyzylorda, Rudnyy, Saryshaghan, Semey, Shalqar, Shu, Shymkent, Taldygorghan, Taraz, Temirtau, Turkistan, Usharal, Zaysan and Zhangatas. Alakol, Aral Sea, Aralsor, Balqash Koli, Buqlyrma Bogeni, Caspian Depression, Caspian Sea, Eritis River, Esil River, Lake Balkhash, Marqakol, North Aral Sea, Ozero Shalkar-Karashatau, Qusmuryn Koli, Qyzylqaq Koli, Saryqopa Koli, Shalqar Koli, Siletitengi Koli, Tengizy Koli, Ulken Aqsuat Koli, Zaysan Koli, Zharman Koli and Zhayyq (Ural River). Kazakhstan has numerous metal and metallic resources such as gold, iron ore, manganese, bauxite, chrome ore, nickel, cobalt, copper, molybdenum, lead and zinc. There are fuel resources which include natural gas, coal, uranium and major deposits of petroleum. Kazakhstan has earthquakes in the southern portion of the country. Other natural hazards include the occurrences of mudslides around Almaty. The land-locked country of Kazakhstan has many environmental issues. There are radioactive or toxic chemical sites (associated with former defense industries and test ranges) scattered throughout the country, which pose health risks for humans and animals. Because the two main rivers which flowed into the Aral Sea have been diverted for irrigation, the sea is drying up and leaving behind a harmful layer of chemical pesticides and natural salts. These substances are picked up by the wind and blown into noxious dust storms. There is pollution in the Caspian Sea. The soil is polluted as a result of salination from poor infrastructure and wasteful irrigation practices, as well as from the overuse of agricultural chemicals. Some of Kazakhstan's cities have severe industrial pollution.